In addition to the D750 DSLR camera, Nikon will also announce a new SB-500 Speedlight flash. The SB-400 has already been listed as discontinued (previously reported here and here) and I think the new SB-500 will be its replacement. 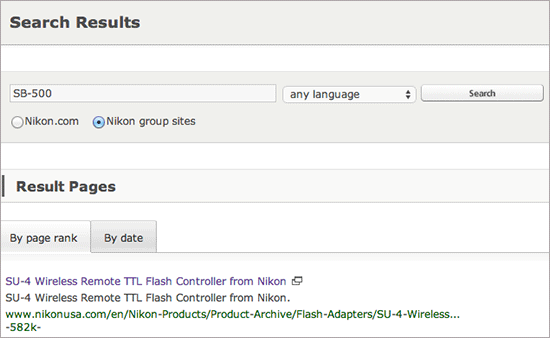 If you make a search on nikon.com for "SB-500", you will see that at some point the flash was listed on nikonusa.com (see screenshot above). This entry was posted in Nikon Flashes and tagged Nikon SB-500, Photokina 2014. Bookmark the permalink. Trackbacks are closed, but you can post a comment.